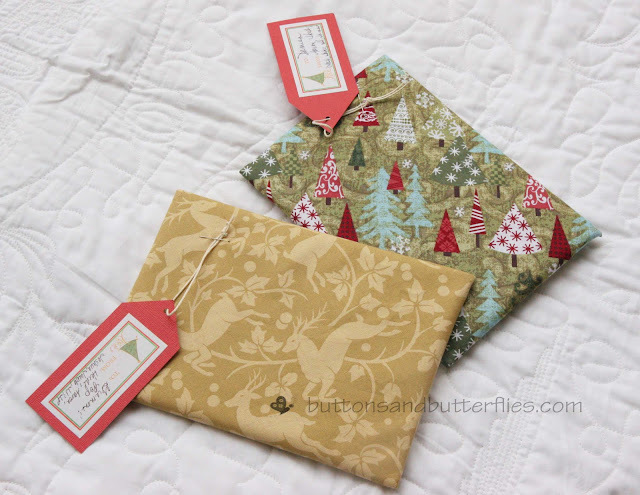 Buttons and Butterflies: Actually Christmas Sewing! Hope everyone is getting through their holiday craziness. Things have been surprisingly smooth around here. I realized last week, that this was the first time in nine years that I have not sewn or altered Christmas costumes for our school musical. I hate admitting it, but, boy, it took up alot of my time during the holidays!!! I have actually been sewing this past week! 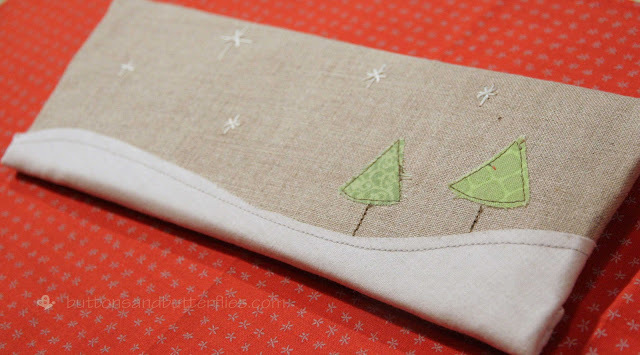 My arm is still not ready for the long arm, but I did do some small Christmas sewing!! Unfortunately, I can't be brilliant and pull off any last minute quilted gifts, but I can make envelopes for gift cards! I abhor gift cards. I don't mind getting them, but sometimes I feel like I am giving a gift card because I have no ideas. I don't like that I can't come up with something perfect for the recipient. Granted, we try to be unique with our gift cards. Sometimes we actually donate to charity in that person's name if they are the older family member that says that they don't need anything. Sometimes we buy a card to the AMC movies and a restaurant so that a couple can make a date of it. For our parents, we occasionally look up their local theater and buy tickets. Usually a few months after Christmas so we don't cause any conflicts. Then there is the situation where we just have to give a gift card to the bachelor family member that buys everything he needs and does not have much room, nor desire, for items for his pad. It is what it is! 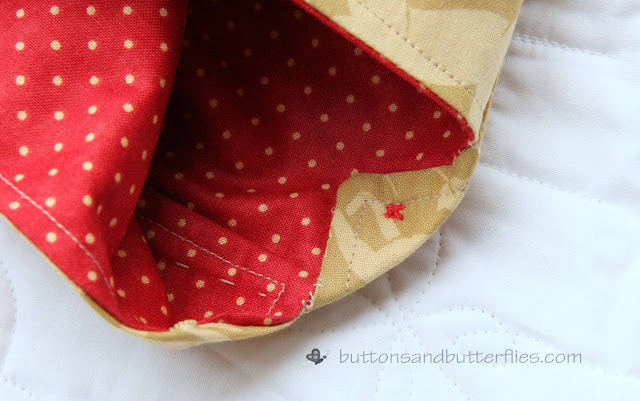 I landed on a great tutorial at Sew, Mama, Sew!!! 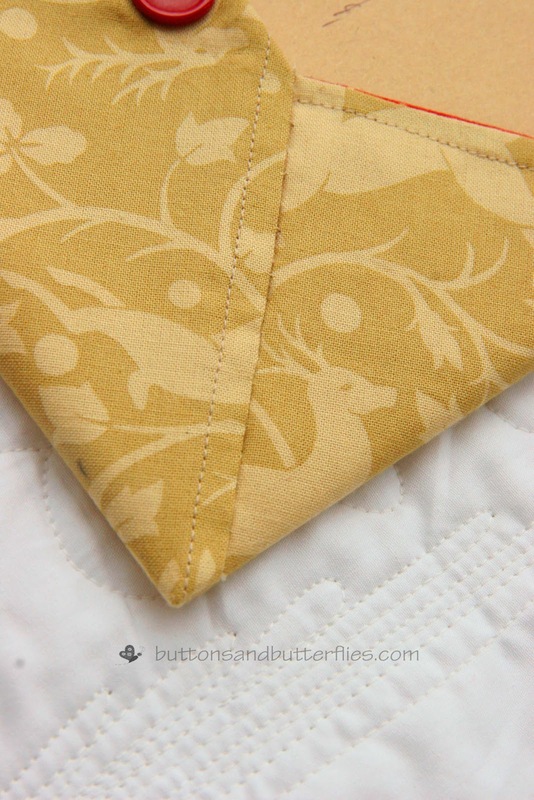 At first, I tried to make my own pattern for a letter size (versus card size) envelope. It was okay, but I wasn't happy with the way the flap turned down. So for the second two, I followed the instructions...minus the interfacing and it was brilliant! 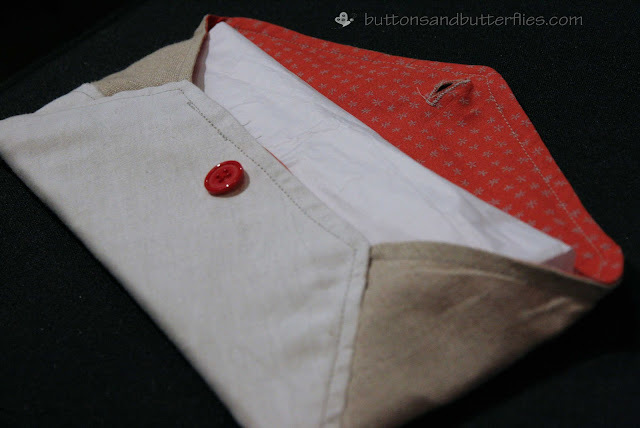 I chose not to do the interfacing because I knew I was putting stiff cards in them. I didn't embroider the back edges like Sew, Mama, Sew' s tutorial. 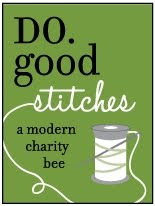 I simply did a ladder stitch. I was running out of time to get it in the mail. I also skipped the step where you cut the corner and make it straight. I was lazy and just turned it into the inside and did some quick ladder stitches inside to get the same effect! I actually finally added wonder under to the tree appliques on my Christmas quilt. Now I actually need to iron them ON TO the top and stitch them. This may end up being a two year project at this rate. 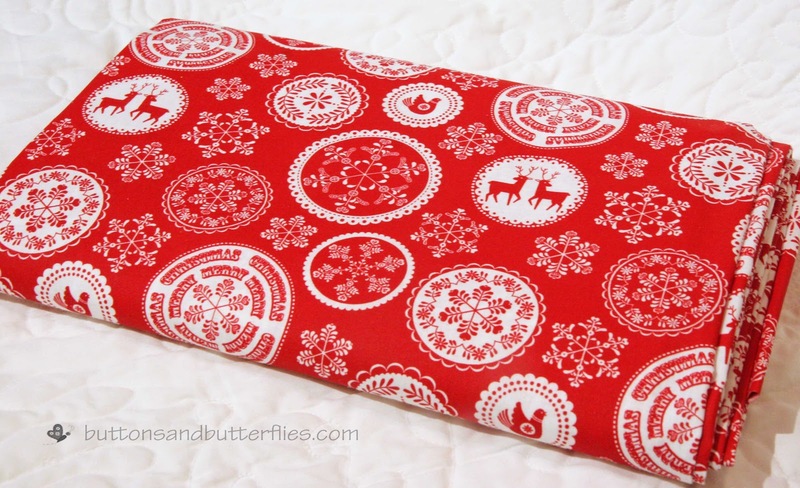 If I do try to use Ole Betsy, this will be the first quilt on her! The kids have their own tree and it really needs it own skirt. Fabric is ready to go. 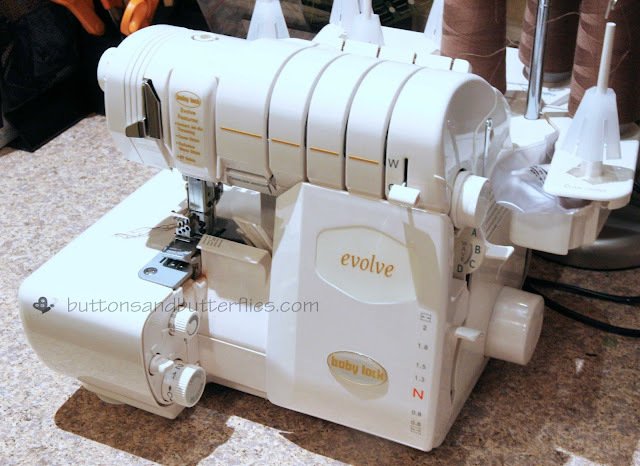 I am just trying to work up the courage to take on my serger. Another machine that I have a love/hate relationship with! 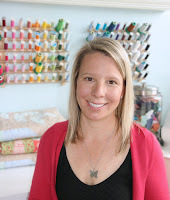 Linking up with Lee at Freshly Pieced! She changed her look and is confusing me a bit. But she has some great new patterns...one of them for free if you are interested! And her new tutorial for a notebook/journal cover? To die for!!! 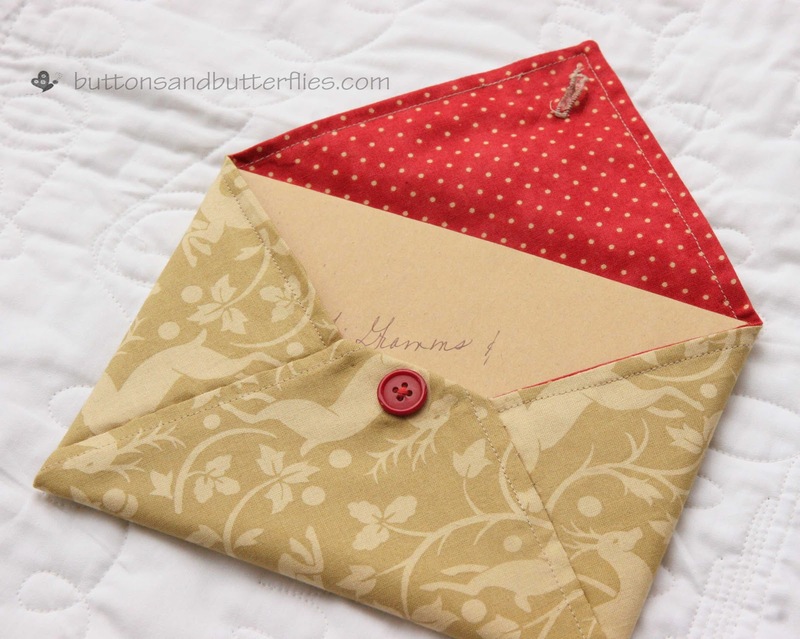 I love the envelopes. They are a great way to gift a gift card. My Mom used to sew for dance and figure skating concerts, so I know how much work it can be. I hope you continue to heal and feel like yourself soon. I like your long tree envelope! I just won a copy of the ruby star wrapping book so I'm trying out some of the reusable wrapping ideas in it- so much more fun than plain paper (although lots of time!) Good luck with the to-dos! 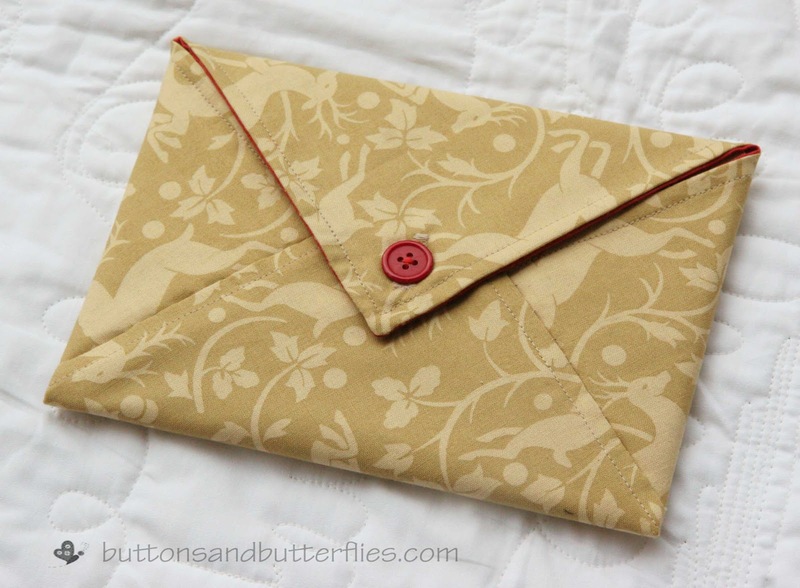 The fabric envelopes are great! Good luck with the quilt. Figgy Pudding is looking great so far!! Beautiful. PS - glad to hear that your surgery went well and you've got the all clear. :-) Merry Christmas!